A thing of Joy at a special time of the year. The right size, not too big. Perfect for a small apartment. This tree will be displayed in the middle of Mr.& Mrs. Snowman. I've got a big picture window that I decorate with snowflakes and sniw couple. This little tree will be the perfect touch between them! I bought this tree to display my beaded cross stitch ornaments at craft fairs, I set it up on a table a week ago to try out my ornaments, it's still there, hate to take it down. It doesn't look like much when you open it up but as you assemble it by munipulating the branches you should be very happy! Have had this tree for about 2 years now and use it for every holiday. Decorate this tree with red lights & ornaments for xmas & Valentines day. With purple lights & ornaments for Easter. With red, white & blue lights & ornaments for Memorial Day, 4th of July & Labor Day. The only holiday I don't use this is Halloween because I have a black tree for this. Absolutely love this tree. I have inspected the product and put it away for next Christmas. My husband agreed to a smaller Christmas tree and I knew which one I wanted. I ordered it immediately. I had this tree some years ago and it was beautiful. I like the size to decorate it on a table top. I wanted something other than a green tree to brighten up the season and room. Such good quality and cute. Not sure if will leave up year around..but could.was so easy to fluff up,looks great,not too big or small. Great price as well. Can not wait. Already decorated with red and white blights.Waiting in basement. Just the right size for a small space. Will be able to use for other holidays. Cute as can be, just right size! Displayed decorated tree (using white wire light strings) in front window for the holidays. It was so pretty from inside and outside! Decorations showed up brilliantly and disassembly was a snap. Easy to store for next year! It is the perfect size for a small table. We recently moved and I tossed my old one that I had for many years. It had become dusty. I have a collection of small ornaments for every month and season of the year that I use on it. The needles are NOT made of paper as a one reviewer stated. They are the same thin plastic that my large tree from another famous company are made out of. The lights sold for it work best as the cord is white to match it. Great purchase. What a lovely "white christmas"
I use this as a second tree. Great tree. I've had it for at least 5 yrs. I do it with blue lights and all blue ornaments. My fiance and I love this tree. We decorated it with Pittsbugh Steeler lights. Next, red for Valentines day then Easter. I don't like to take down my pretty Christmas tree ater the Holidays. With this one, I can leave it up all year long. This is affordable too. I love this tree. Put it up for Christmas, decked it out in some decorations and it was absolutely beautiful. That is, until the cat knocked it over, it's made so well, it stayed in tact. I'm thrilled with this find, and have told a few friends, know they would like it too. I looked all holiday season for a 3 foot white tree and could not find one. Then I saw your tree and I was overjoyed. I can't wait to decorate it next Christmas! I have my 6 ft tree that I love but I wanted a little tree in front of my living room window. It is so cute and what a deal! Love this tree! Easy to handle and put together. Good size, pretty shape, made well. Several of my friends and family members want to buy one after seeing mine during the season. Have bought several. Perfect for decorating for anytime! Decorated and displayed this tree in the front window. White wired lights were perfect! My tree and decorations shined brightly inside and outside for all to see! Easy to disassemble and store for next year's use. Wonderful addition to holiday decor! Pretty in my re-modeled family room. It's not made as well as I hoped, but it dressed up nicely. First time to use it we'll see how it holds up. I have wanted a white tree for a long time. I was initially disappointed when I took it out of the box, thought it looked very cheap. However, once it is decorated with my white lights and sparkly garland and ornaments, I am very pleased with it and will look forward to using it again. It was very easy to set up and should be easy to store as well. I look forward to trying different color combinations in future years. This year I went with silver and red ornaments and white lights. can use this tree anytime. Always wanted a White Christmas Tree small enough to put a set of White Lights on and change the Themes accordingly to the Holidays and Times of the year. YES!! 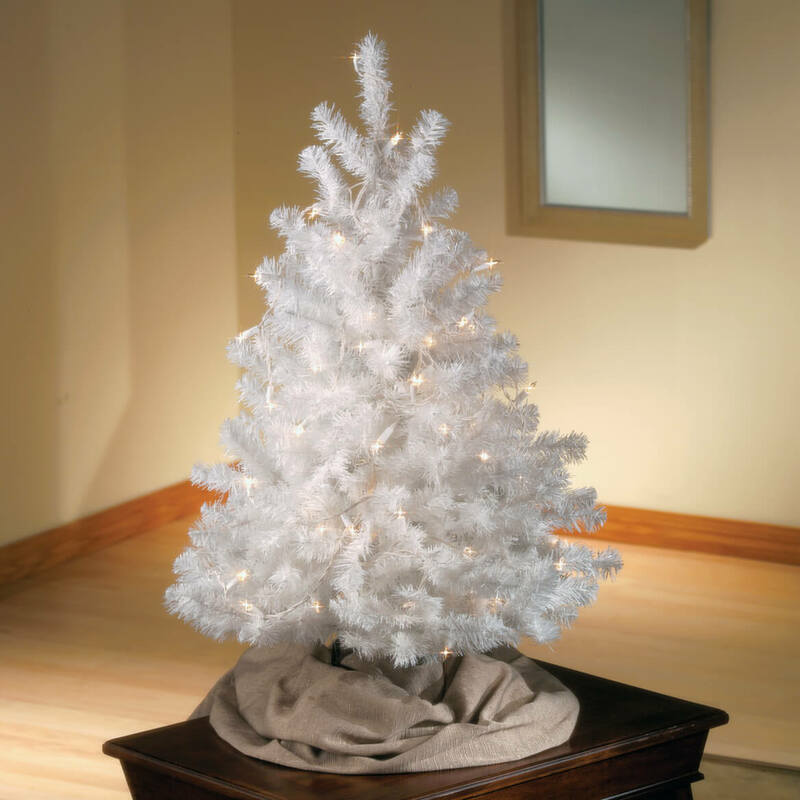 I've been wanting a small white tree to decorate for other holidays and parties. I think it fits better than a green for year round. Branch on bottom was broke but I think that was just a freak occurrence. I really do like the Holiday Tree. I will be using this all year long. You had this tree a few years back and my husband and I bought all sorts of baby items and decorated it for my Daughter-N-Laws shower. It was a huge hit. It looks festive dressed up. Thought it was made of different material, it's made of some kind of paper that shreds and this is the first time I've used it so we'll see how it holds up. I got this tree so we could decorate it each month with different celebrations. This month we will decorate for Valentines Day, plus one of our Grand daughter's birthday is this month. I'm very excited to see how it looks all decorated. MY HUSBAND IS BED RIDDEN AND I WANTED THE TREE TO BRING A LITTLE CHEER IN HIS LIFE FOR HIM TO HAVE SOMETHING TO LOOK AT. I have all white tree's,in my home but one "3 Green Tree. Saw this one had to get it!! i wanted a white tree. Looked like a nice tree for a low price. Will find out. Looked pretty,was full and other reviews were positive..
Love the white tree. It's just the right size for a table. I have been wanting a small white tree and this looked like a good choice! I choose this color tree, because it symbolizes the meaning of Christmas snow, for the one's that live in a warmer climate. I will always have that Christmas feel with this tree no matter where I take it or place it, I'm using this size tree to take along on a trip to Arizona. I choose this tree for my guest bedroom. My room is done in lavender decor and I plan to use purple pointsetts on the tree. because I have a small home and it will fit perfectly. I got one from FREEcycle years ago, and when I got it it was yellowed. At night it looked fine, but during the day, well...at 30% off the $16.99 price, I decided to recycle my old one, and get a nice one. Hope it comes quickly! because it is very pretty. It looks like the perfect little tree for Christmas. I have always wanted a little white tree. So when it comes I will see. I like the idea that this can be used in any season. 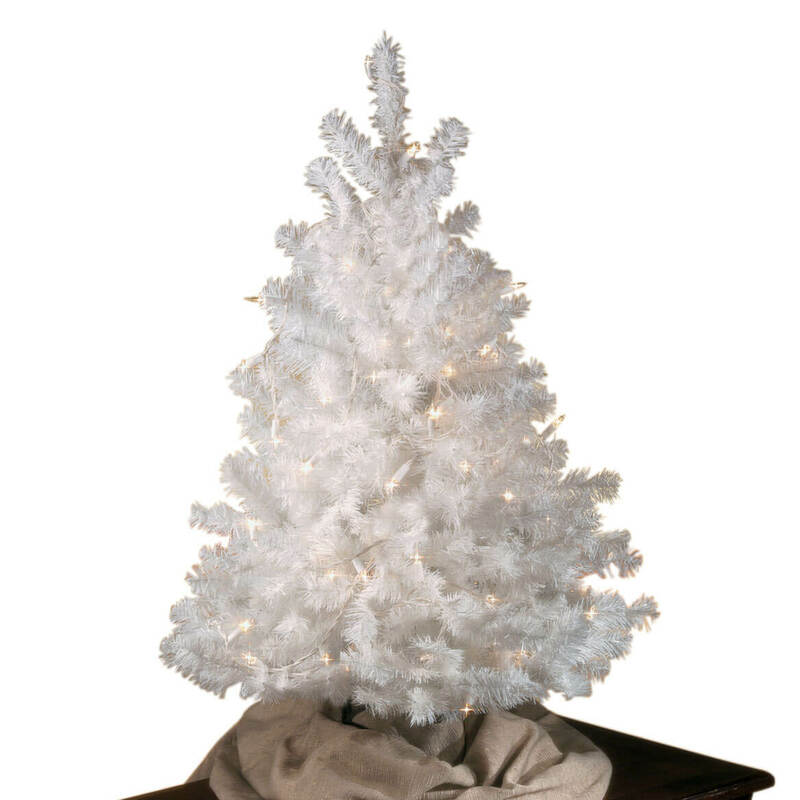 I've ordered this cute little All-Occasions Tree before. It's fun to decorate. I love it! I have been searching for an all-season tree to use the decorations that I have purchases over the years. I believe this will be the perfect tree! This is the Cutest tree..Can't wait for it to come..I have pink decorations and lights and I want to surprise my little Grand Daughter. Her favorite color is pink .. Still waiting for it, but hope it is as good quality of all my other products from Miles over the yrs. I have purchased 3 of these trees. The tree is full of branches. I have decorated them and given as Christmas gifts. It is enjoyment for me as well as the person who receives them.. I like this tree to display my small ornaments. I purchased this because it looks so pretty. I live in a small space, so I needed a small tree. Also, the price was amazing! i can't wait to see if it is as pretty as the picture! The reviews were positive and I liked the idea of keeping the tree up year round! Is the tree in the picture in your catalog the exact one I would be sent? One review said it isn't & the one she received was made of paper & shredded. What is the tree made of? BEST ANSWER: This lovely snow white pine tree is true to size, i.e. 3 feet. Lights and ornament color scheme can be altered based on season and/or preference, such as purple and gold, blue and silver, red and green, etc. Perfect for table top! Thank you for your question. This is 3' tall. We hope this information will be of help to you. It states that it is three feet. what size is the widest point of tree? BEST ANSWER: I only have a rigid measure, so it's about 21 inches side to side and it fits perfectly on a 14" window ledge. Hope that helps. I love the tree. It depends on how straight you make the branches, as opposed to angled up, but mine is 23 inches. Approximately 21 inches. This is a very nice tree. The picture does not show the stand. How many legs does it have? Is it a one section tree trunk? BEST ANSWER: I bought this tree last year and if I can recall, it has 3 plastic legs that slide on to the bottom of the tree trunk. It is really pretty once you shape the limbs, put lights on it, and decorate it. Thank you for your question. The tree has 3 legs. We hope this information will be of help to you. It has 3 legs and I believe it is all one piece if memory serves me. How many light strings does the tree need? BEST ANSWER: I only have one, but more would definitely be OK. Just remember to look for lights with white wires! I have one string of 100 lights on it, and it seems about right to me. one string should be sufficient. BEST ANSWER: I use mine indoors and it is a very pretty little full tree. I am hesitant to say 100% yes to using it outdoors but possibly. With anything left outdoors it may show signs of weathering. The base is plastic and the branches are metal. The needles on the branches look like paper but feel like a soft plastic. Thank you for your question. We do not recommend them to be used out doors as any bad weather will ruin the tree and not last as long. We hope this information will be of help to you. Perhaps, depending on where you live, of course. Harsh weather may only allow one season's use. Mine was for indoor use so I cannot answer from experience. BEST ANSWER: Thank you for your question. The stand is the only item needing to be assembled. We hope this information will be of help to you. The tree branches look like they are soft or are they plastic or real artificial looking? BEST ANSWER: The branches are soft and flexible, yet sturdy enough to hold small ornaments. I keep mine up all year and decorate it for the season. Love it with the multicolor lights on a white cord. How real looking can an all white tree look? Is this tree battery operated? BEST ANSWER: Thank you for your question. Unfortunately no this is plug in only. We hope this information will be of help to you. led lights for tree #309945? BEST ANSWER: Thank you for your question. The lights are not included. We hope this information will be of help to you.